If you’ve a modest sized game room like many videogame fanatics you probably already have enough novelty controllers, steering wheels, lightguns and 360 degree motion sensor laser tracking HUD’s to fill a small museum as it is. Fitting in a good quality joystick for each system you own might be a tall order indeed. One solution to this problem is to buy a joystick that will fit all of your consoles, though this is easier said than done. There are several options on the market that fit a range of consoles, from the gorgeous looking Eightarc fusion to the do it yourself Paewang Revolution. One option with excellent multi-console support is the X-Arcade Tankstick. The stock X-Arcade has many attractive features. It’s widely available, backed up by full technical support and has a huge range of adaptors to make it work with lots of different consoles. 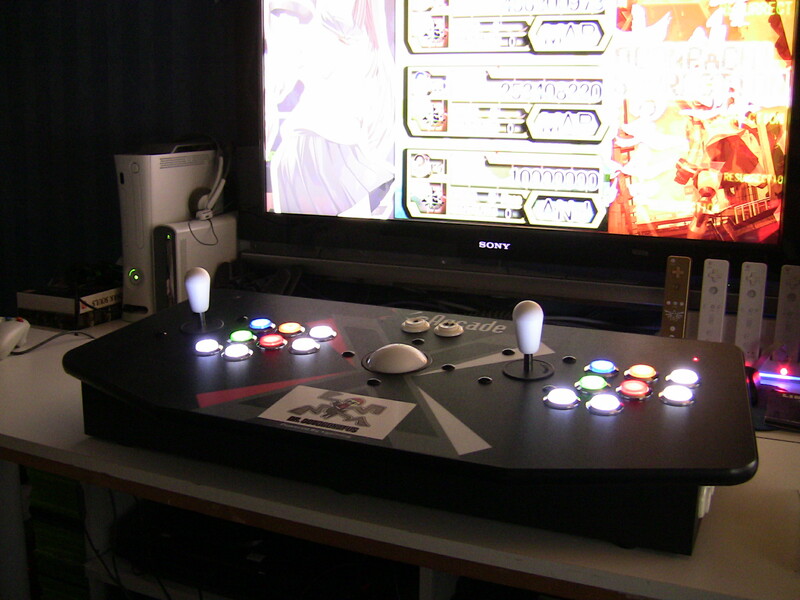 However, many gamers dislike the stock joysticks included with the X-Arcade unit. Though this is a matter of opinion certainly, fighting game enthusiasts in particular seem to prefer joysticks manufactured by Sanwa. Another great feature about the X-Arcade is that X-Gaming don’t discourage end users or resellers from modifying the stick. Don’t like the joystick mechanism installed by default?, simply strip it away and substitute it for the model of your choice, all without voiding your warranty. One company that has taken this idea to the next level is UK based Gremlin Solutions. Gremlin Solutions are a well known provider of arcade and leisure equipment here in the UK. Using their considerable engineering experience, they have taken the X-Arcade to the next level with two important modifications. First of all, the standard X-Arcade joysticks have been replaced with Sanwa JLW-TM-8 parts. Sanwa joysticks are amongst the most highly regarded genuine arcade joysticks available. Manufactured in Japan, these sticks suit both fighting games and shmups too. Gremlin weren’t satisfied with merely upgrading the joysticks however, and have also included a full set of illuminated buttons. The colours of these illuminations can be chosen by the customer at purchase time, so you can configure the button layout to match your most commonly used console. The lights are powered by USB and can even be programmed in certain PC front-ends to flash in sequence. If you’re the type of gamer who likes to play with the lights down low, laughing in the face of those “always play in a well lit environment” advisory messages, you’ll love the X-Arcade Ultimate. Of course, the X-Arcade Ultimate comes with all the trimmings that made the original X-Arcade so good. 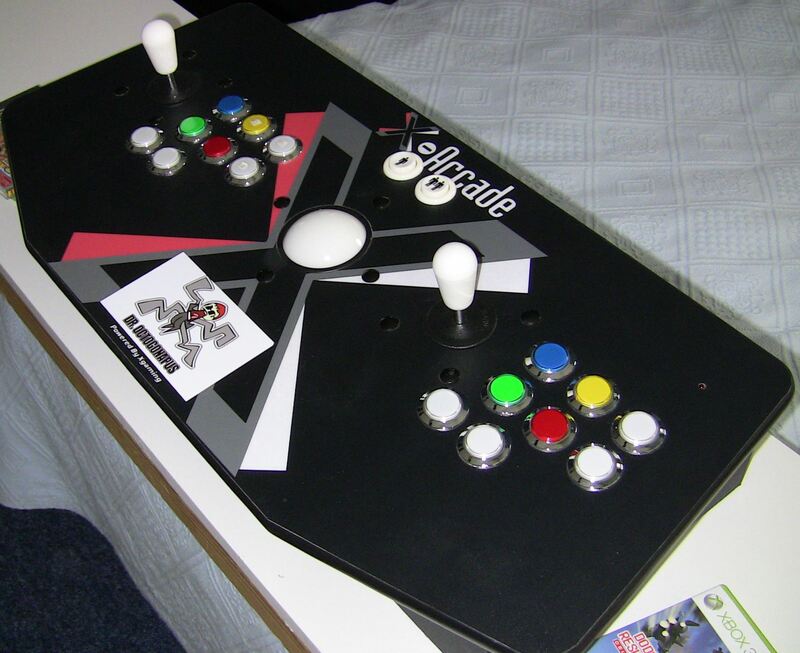 Because this is the Tankstick, X-Arcade’s flagship model, you get a full trackball in the middle of the stick, ideal for games like Marble Madness or even those wonderful Golf simulators. If you’re partial to a round or two of simulated pinball, you will find buttons on either side of the stick, just where you’d find the flipper buttons on a real pinball table. In use, the Sanwa sticks are quite sensitive, they may take some getting used to especially if you’ve not used a joystick for a while. Their accuracy is spot on however, even a ham-fisted Street Fighter player like me can (usually) hit his special moves on these sticks. The X-Arcade stick comes with the required cables for attaching to your PC. Rather than being recognized as a Joystick by Windows, the stick will actually imitate a keyboard. Windows can support multiple keyboards and mice and this approach means that virtually any PC game will work with the stick, regardless of age or poorly thought out joystick controls. Of course, games requiring analogue controllers won’t work, but then the X-Arcade isn’t exactly designed for Microsoft Flight Simulator. The Trackball in the middle of the stick is recognized as a standard mouse and both USB and PS/2 connections are supported for both the Joystick and the trackball. Should you encounter a game that does not allow for its keyboard controls to be redefined, you can even make custom button mappings on the Joystick itself. There are three memory presets for you to store the mappings, though this feature only works on the PC and not with the console adapters, which we will get to later. Gremlin supply both bat and ball tops for the sticks, allowing the end user to choose which they prefer. In my pictures I’ve attached the bat tops as these seem to suit my shmupping preferences better. To change the tops it’s simply a matter of unscrewing them. Surprisingly, although the tops fit securely, I’ve managed to unscrew them accidentally a couple of times during more frantic gaming sessions. To compensate for this they could be glued of course, that’s entirely up to the end user. Should you want to use your X-Arcade with a system other than the PC, X-Gaming make a range of adapters. Currently, the list of consoles supported includes Dreamcast, Playstations 1 2 and 3, Gamecube, Wii (via Gamecube controllers only) Xbox and Xbox 360. Previously, these adaptors were sold individually, which made the cost of buying a whole set somewhat high. Recently however, X-Gaming have re-vamped their adapters and you can now buy a 5 in one device for the Gamecube/Wii, PS1, PS2 and Dreamcast and a 2 in 1 adapter for the PS3 and Xbox 1. The Xbox 360 is more complicated due to Microsoft’s silly hardware encryption standards. The original X-Arcade to Xbox 360 adapter required the connection of a standard, wired Xbox 360 pad along with the adapter cable and did not support headsets (other than the wireless headset) or, more critically, the X-box guide button. This meant that you needed a remote control (such as the Xbox 360 Universal Media Remote) in order to open the guide to check your friends lists or achievements. The new adapter that the company sells appears to support headsets now, although support for the guide button is still listed as being “limited”. Xbox 360 problems aside, the adapters work flawlessly. There’s no perceivable input lag and the adapters even allow for the X-Arcade joysticks to emulate either the d-pad or the analogue sticks. Care must be taken when attaching the older adapters not to muddle them up. Incorrectly connecting one adapter to my Sega Dreamcast, for instance, resulted in a blown controller board. With the multi-adapters that’s much less likely to happen, of course. If you like to play on older consoles, you’re probably wondering where the retro adapters are. Sadly, X-Arcade don’t manufacture any adapters for older machines, but luckily all is not lost. Tototek manufacture a wide range of retro adaptors that allow for Playstation 2 controllers to connect to Saturns, SNES’s, Neo Geo’s and more. Have a look at their entire range for yourself here. The adapters may be relatively cheap but they are definitely cheerful too, having no noticeable input lag and support for functions like auto fire. Connect the X-Arcade’s PS2 adapter into one of these and then hook up your retro console of choice. The only console I regularly use that wasn’t covered by the Tototek adapter range was the Amiga CD32. For this particular machine I used the amazing Kipper2K Playstation adapter, which is possibly the best joypad adapter ever built for machines that use the Atari/Commodore style 9 pin joysticks, but sadly no longer appears to be in production. One stick to rule them all? At a eye watering £259.99 + VAT, the X-Arcade Tankstick Ultimate isn’t exactly a cheap purchase. The cost of buying the adapters you require for all your consoles must also be added onto the top of this. If your budget will stretch however, the Tankstick ultimate is a fantastic addition to your gaming setup and one that will last for many years to come. At first I was cynical about how big a difference light up buttons would make, but in practice they look lovely and make the buttons super easy to identify. If you’re looking for the ultimate Joystick for your gaming setup, look no further, the X-Arcade Tankstick Ultimate is the ultimate marriage of American, Japanese and UK gaming technology and will take pride of place in any games room, big or small. To find out more or to order a Tankstick Ultimate, contact Gremlin Solutions via their website. Fixes everything wrong with the standard X-Arcade. A truly amazing joystick.